Prekas Traditional Products is located in Syros in the middle of a stretch of grocery stores along the main road of Ermoupoli, the island’s capital. For decades now, this has been considered the finest and best-stocked grocery store in all the Cyclades. Kostas Prekas, the venture’s very active founder, keeps his store’s fridges and shelves stocked with items such as Cretan graviera cheese, beans from Prespes in the western Macedonia region of northern Greece, and Greek truffles. Needless to say, the store also carries an extensive selection of products hailing from Syros and other Cycladic islands. Syros marmalades, thyme honey, halvadopita (a nougat-based sweet), loukoumia (jelly-like sweets covered with icing sugar) are all available, as are wines produced by the Syros Winery and various other local culinary delights. The island of Paros boasts three wineries, a brand new locally-brewed beer named 56 Isles, souma (a potent grape-based spirit), zaharobaklava sweets (sugar-covered almond and honey cakes), and graviera cheese, as well as other cheese varieties produced by the island’s cooperative. 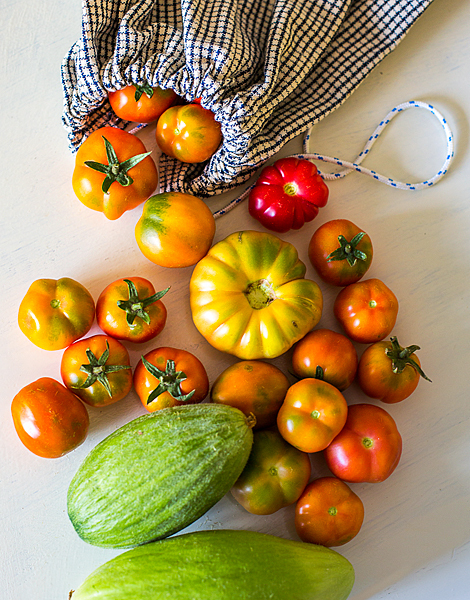 Paros is also renowned for its vegetables, and the owner of the Arsenis Delicatessen, Arsenis Loukis, cultivates his own organic vegetable field. All the aforementioned products, as well as select items from nearby islands and other parts of Greece, may be found at his establishment, a well-managed and up-to-date deli with something for everyone. The tomato paste (beltes) of Milos is well known for its dense flavor and the unique taste provided by the local tomatoes used in its production. 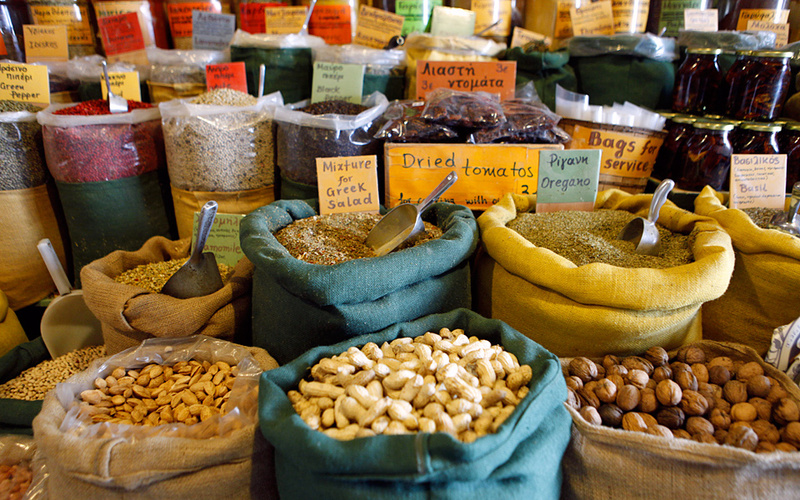 It may be found at the Tsakanos Grocery Store along with other local products as well as delights from beyond the island. Be on the look-out for for locally produced honey and herbs, the local Milos lasagna, the yellow pumpkin preserve known as myrodato koufeto, and the cheese products that bear the Haralabakis brand. Make sure to try some of the various pickled products that they stock, too – you won’t regret it. In the heart of the village of Chorio, the capital of Kimolos, a small grocery store gathers under its roof the entire range of what is produced on the island, a small but high-quality variety of goods. There’s fresh manoura cheese made with sheep and goat’s milk, gylomeni cheese (matured in wine sediment), the fantastic local sour cheese known as xinotyri, and fluffy myzithra cheese, as well as mountain-grown capers, samphire pickle (kritamo) and salty tomato paste, all here at the Farma tou Sablou, the grocery store run by Antonis Antivahis. Meat-lovers take note: exceptional local goat meat is also available. If you’re interested in stocking up on special food products from Tinos, visit the store run by the local farming cooperative, the “Pratirio Enosis Georgikon Sineterismon”. In addition to cheese and dairy products produced by the cooperative, including graviera, kopanisti, tyraki – the local version of traditional volaki cheese, and myzithra cheese, you can also find varieties of honey, including thyme honey, rakomelo (an alcoholic beverage that combines the local spirit with honey and spices), wines made by three island wineries, as well as many other delicacies produced on the island. They include local pasta products, rusks, capers, samphire (kritamo), dried figs and small artichokes in oil. 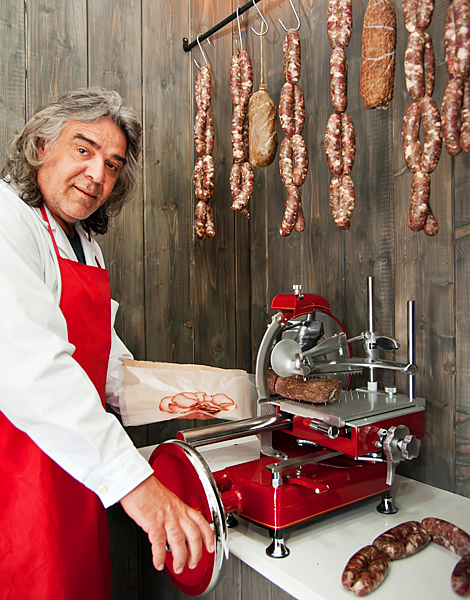 A recently renovated butcher shop run by Stavros Menagias sells renowned Mykonos sausages and a superb version of the island’s celebrated louza, a cold cut seasoned with allspice and summer savory. Cheese and cheese dip products made locally are also available here, while the selection is further complemented by specialties from other parts of the country, including PDO Santorini fava beans and the renowned Miran brand of pastourma (air-dried cured beef). By arrangement, the butcher can also prepare sysera and/or paida, two traditional cold cuts that are now quite hard to find. Adhering to the standards of the flashy lifestyle that defines modern Mykonos, the Flora Market outlet near the airport sells foodstuffs from around the world. International delicatessen products sit on the shelves alongside top-grade culinary selections from the Cyclades, including fine honey, wines, cold cuts and cheese products, particularly Mykonos cheese varieties. The outlet also offers an exceptional selection of outstanding Greek olive oil. Hard cheese, traditional volaki cheese (both fresh and aged), anthotyro cheese selections, yoghurts and sygathoura (a heat-treated butter) may all be found at this traditional grocery in Chora, the main town of Andros. All products sold at this shop, run by Achilleas and Athanasia Giannakis and located along the principal pedestrian street, are local. Other items to look out for include: traditional rusks; pabiloni – a sweet citrus fruit preserve; soft pastel – a sesame and honey bars made using local thyme honey; and local amygdalota – almond-based biscuits covered with icing sugar. 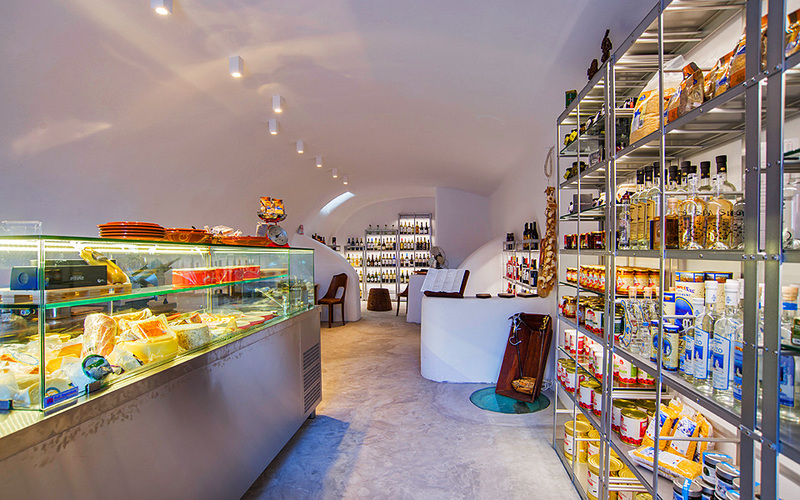 On the shelves of Oia Vineyart, a superbly designed wine and delicatessen space in Oia, you can find all the wines of Santorini as well as many other island specialties, including fava beans, tomato paste, dried tomatoes and capers, to name but a few. 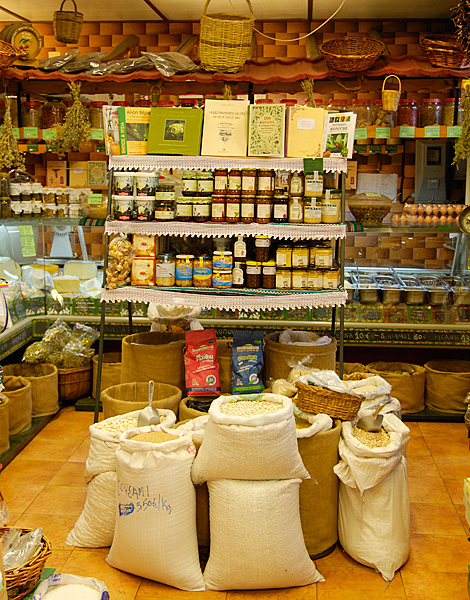 There are products on offer from beyond the island as well, representing the Cyclades and other parts of Greece: in the refrigerators you can find arseniko cheese from Naxos; spicy skotyri cheese from Ios; volaki cheese from Andros; black pork salami from Evritania; apaki, a lean herb-smoked pork from Crete; and, from Tinos, a tasty version of the sliced meat known as louza. INFO | Sidera location, Oia, Santorini, Tel. (+30) 22860.72.046. Tinos: Delicious louza and saltsisi cold cuts are available at the grocery-delicatessen store run by Yiannis Kritikos (Vintsi, Chora, Tel. +30 22830.29.280). 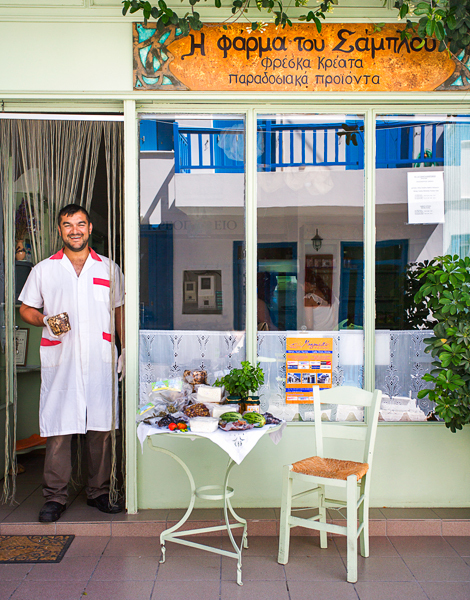 Naxos: For arseniko cheese and local meat products, try Koufopoulos (Aghios Isidoros, Galanado, Tel. +30 22850.24.918). Santorini: All the fine things produced on the island, from fava beans to capers and wines, as well as Cycladic cheese products, may be found at Meze&Wine, a gastro shop associated with the celebrated Selini restaurant (Pyrgos, Tel. +30 22860.22.249). Amorgos: An exceptional local honey that was awarded a 2016 Gastronomos Prize from the Greek culinary magazine of the same name may be purchased by contacting producer Panagiotis Maroulis (Lagada, Tel. +30 6932.272.419). 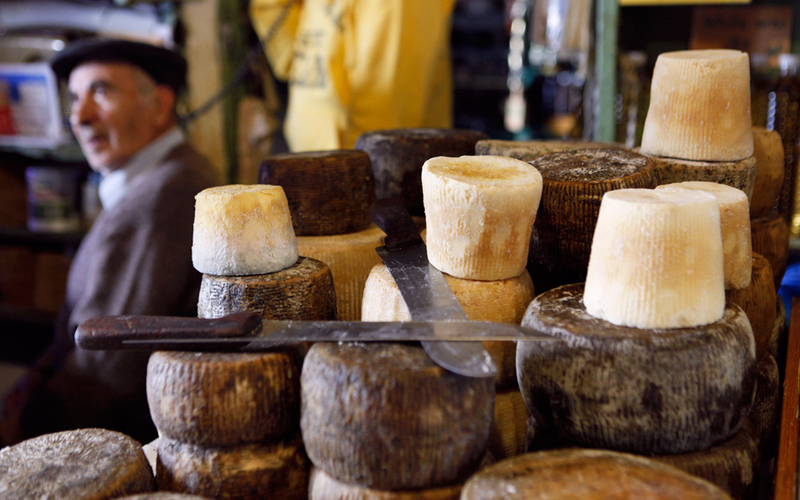 Ios: For skotyri and other local cheese products, head to Mosenta (Port, Tel. + 30 22860.92.294). Serifos: For bottled wine produced by Christos Chrysoloras, and other Serifos products, drop by Glykaromata (Chora, Tel. +30 22810.51.456).